For the most part the Legendary Deck Building game had focused on two main paths - the main line following the adventures of various characters from the Marvel Universe and the Legendary Encounters line that seemed to initially focus on science fiction horror properties like Aliens and Predator. And this already felt like a great expansion of the line while still focusing on the Deck Building flavor that has been distinct to this line. And then Legendary: Big Trouble in Little China came out. This was not something I had ever expected to happen. I appreciated the movie as a cult classic of sorts but for it to merit the sort of investment that comes with a game like this felt almost surreal. But it just went to show the sort of quirkiness that appealed to the team and it's a brand of entertainment we're totally game for. 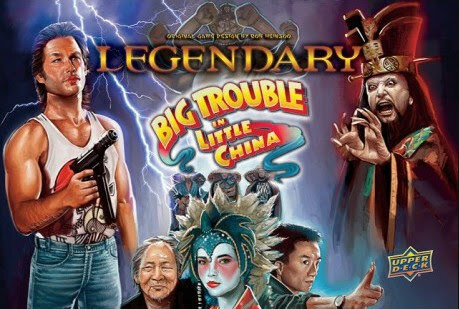 Legendary: Big Trouble in Little China is based on the 80's movie of the same name and designed by Rob Heinsoo. It's primarily compatible with the main Legendary line (think Marvel) given it is not an Encounters title. The cooperative game continues to have 2-5 players work together to defeat the enemy, but this time you're playing characters from the cult classic movie. Will you be our clueless hero Jack Burton or even his truck the Pork Chop Express as you face Lo Pan, the Three Storms and other quirky characters in Chinatown. One of the changes to the game include how the starting deck now includes 2 Mediocre Heroes, which give you additional powers under the right circumstances. It's a nice new spin on the original game but one that doesn't give too much power with the base cards alone. Then there's how two paces of the city are also tagged as "Chinatown" and many cards have special effects or consequences that trigger when they're in a Chinatown space. What I Liked: If you like the Marvel Legendary game and you like the movie this set is based on, then it's a really fun experience. There are a lot of great nods to various moments in the movie as immortalized in the card and this can make for a lot of fun with players who are familiar with the game. It's close enough to the core game to be played easily enough but with some nuances of flavor that help it along. The Chinatown mechanic seems simple but given the many cards that tie to it, then it becomes something important. Sometimes you want a villain to get to Chinatown for better rewards when you defeat it but other times villains can get "stuck" there, complicating your game significantly. But hey, it's all worth coming against Lo Pan in his various forms right? Plus I love the ridiculousness of how so many villains have similar names because we are talking about a single gang acting as the antagonists in a movie. What Could Have Been Better: As a consequence of the movie being mainly a martial arts comedy piece, the usual split of card types feels off and there's an imbalance in card "colors". Black Tech cards are now primairly with the Pork Chop Express since...it's a truck. And Blue Magic cards aren't spread out since it's not like Jack had any magical abilities in the movie. And so you get a lot of characters who are Strength (Green) based with all the punching and kicking that needs to happen. As you can tell from the box art, the quality of art in this set is a little all over the place and you can only find solace in the fact that the truck was drawn well. The uneven art is a little disappointing and was a problem also observed in the Firefly game. And on the whole the game does not feel special enough to merit it being a standalone set so it's not quite as awesome as hoped. It plays okay and is a decent experience but not a truly innovative one. TL;DR: Legendary: Big Trouble in Little China is still a lot of fun and will make you want to watch the movie again just to remind yourself how unnecessarily convoluted the mastermind's plans were. It could have been more unique and could have tried to add more to the experience but it went for a safer path. Thus the game gets a good 3.5 priceless movie scenes immortalized as distinct cards out of a possible 5.